After creating your website, the next important task for you is to add content to your website. Muvi allows you to add content for Video On Demand (VOD), Video Live Streaming, Audio on Demand and Muvi Kart. Under Video On Demand you can add 2 types of content; Single Part Form (Movies, Video Clips) and Multipart (TV Series). Click Here for More Information on Content Metadata Types. Under Video Live Streaming you can add content for Feed (If you have existing feed) method and Camera (Live streaming from camera) method. Before adding content to your website, you need to add Content Category. Click Here to know how to add Content Category. You can also edit the content forms according to your preference. You can add new fields or remove existing fields from the content form. To know how to manage content forms Click Here. If you want to add bulk Content Metadata to the Content Library page then use the Import feature. This feature helps you add Content Metadata of several content at once. Please Click Here to know how to Import Content Metadata. 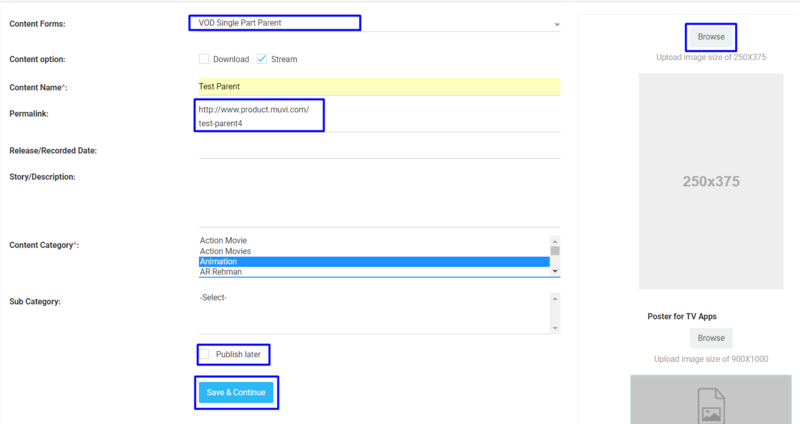 To add content to VOD-Single Part Form content, go to “Manage Content”-->”Content Library” in your Muvi CMS. In the “Content Library” page you can see the list of all your content those are already added. Click on “Add Content” button to add new content. In the Story Description field describe the story briefly if it’s a movie or for other kind of Single Part Long Form content you can write the description accordingly. Select the Content Category form the drop down list. (Such as Movie, Sporting Events, Documentary etc.) Here you can select multiple category for the same content. If you want to show content category in the content details page of your website then Click Here. Please visit "Managing Content Category" help article page for the steps to edit or create category. Select the "Publish End Date" and "Publish End Time" if you want to hide the content from your store after a specific date and time. Your users will not be able to view/search the content after the specific date and time is over. You can also only set either the "Publish Start Time" or "Publish End Time". If you select only the "Publish Start Time" then the content will be published on the specific data and time and will remain in your store. If you select "Publish End Time" only, then the content will be published immediately but will be hidden form the users on the end date and time. 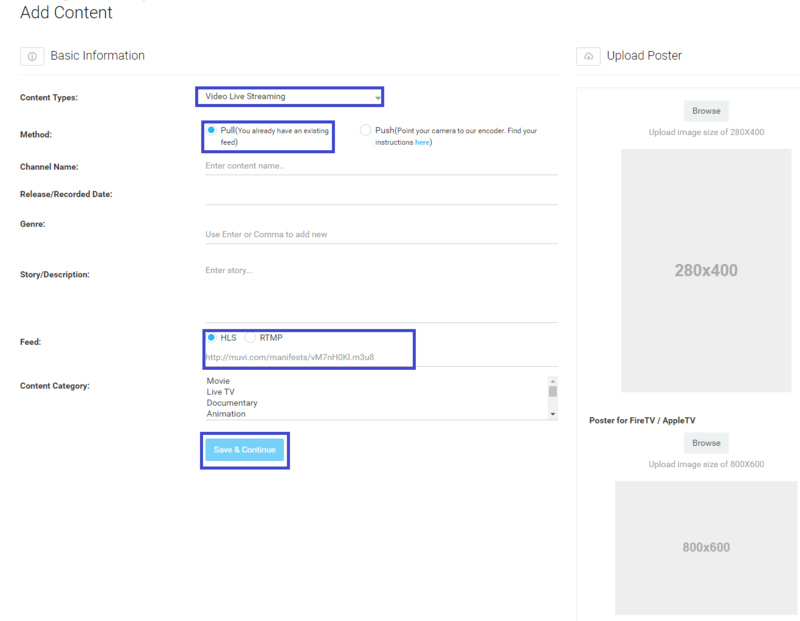 Under Upload a Poster, click on the “Browse” button to upload a poster of the content in the mentioned size (See Below Screenshot). Then click on "Save & Continue"
After you click on "Save & Continue", you will see the options to "Upload Preview", "Upload Top Banner" and "Add Cast/Crew". You can only see these options when adding Single Part Long Form content (For example, movies) and Multi-Part Parent content (For Example, TV Series). A window will popup. Here you will see 3 options to upload preview. Click on “Upload File” if you want to upload the video from your computer. When asked for confirmation, click on “Upload”. The video file will be uploaded and start encoding. When the encoding will be finished, you will able to see the preview. Click on “Choose from Library” if you want to select the preview video from your Video Library. Select the video and it will start encoding. Click on “Embed from 3rd Party”, if you want to embed a 3rd party video link (YouTube, Vimeo or link from another online video platform) for the preview. When you embed 3rd party link there will be no encoding. You can watch the trailer instantly. To know how to obtain 3rd party video link please Click Here. After uploading the "Preview", click on "Preview Video" to see the preview you have uploaded. To change the preview, click on "Change Video" and then select the video you want to change to. You can remove the preview by clicking on the "Remove" button. When asked for confirmation, click on "Yes" to remove the preview. To select banner from the gallery, click on “Choose from Gallery”. Select the image and then resize it. A Multi Part content has two parts. 1. Parent 2. Child. For example, a TV Show is a multipart content type, where the Show is the Parent content and the episodes are the Child content. First you need to add Parent content and the you can add the Child content. In the Story Description field describe about the show briefly. Select the Content Category form the drop down list. (Such as TV Show, Series etc.) Here you can select multiple category for the same content. Please visit "Managing Content Category"page for the steps to edit or create category. Under Upload a Poster, click on the “Browse” button to upload a poster of the show in the mentioned size (See Below Screenshot). Then click on "Save & Continue" . Note: After you click on "Save & Continue", you will see the options to "Upload Preview", "Upload Top Banner" and "Add Cast/Crew". Please follow the above mentioned steps for "Single Part Form Content". In the Story Description field describe about the episode briefly. 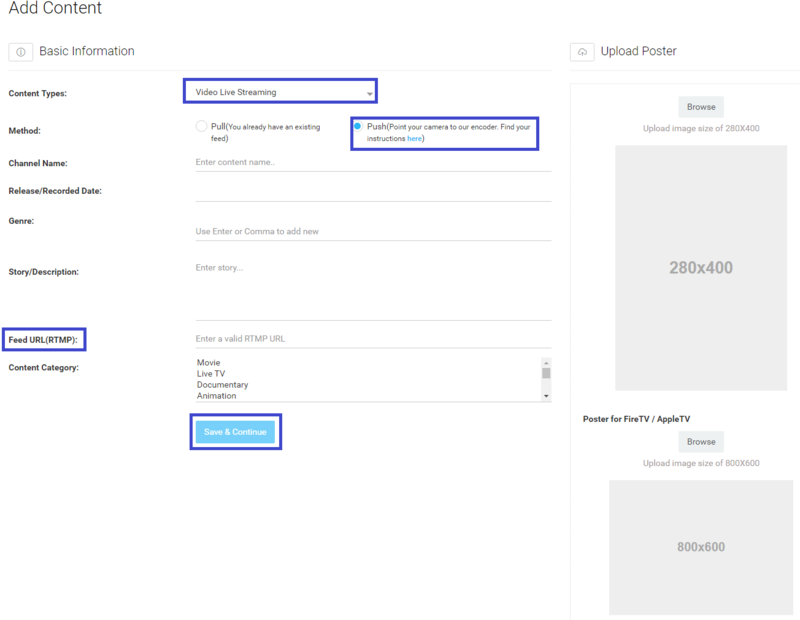 Under Upload a Poster, click on the “Browse” button to upload a poster of the episode in the mentioned size (See Above Screenshot). Live streaming has 2 methods, Feed and Camera. Select Feed if you have existing feed and select Camera when you want to live stream from the camera. In the Story Description field describe about the live streaming briefly. Select the Content Category form the drop down list. If you want to show content category in the content details page of your website then Click Here. Here you can select multiple category for the same content. Please visit "Managing Content Category" page for the steps to edit or create category. Under Upload a Poster, click on the “Browse” button to upload a poster for the live stream (See Below Screenshot). Select the Content Category form the drop down list. Here you can select multiple category for the same content. Please visit "Managing Content Category" page for the steps to edit or create category. After adding content to the Content Library, you can view all the content including Digital (Movies, Video Clips, TV Shows, Live Streaming, Audio) and Physical (Muvi Kart Content). You can use the different filtering and sorting options to view specific content. First click on “Filters” in the Content Library. You will see different filtering options including, ‘Filter By”, “Show”, “Sort By”, “Content Type” and “Update Date”. Under “Filter By” you will see 2 options. “Content Category” and “Content Format”. Under “Show” you will view all the content category options. Select the specific category to see all the content added under it. Under “Show” you will view all the content format options. Select the specific format to see all the content added under it. You can view the content according to the filtering options you have selected. Finally, click on “Update Content”. Your content will be modified. To know more about how to Edit Content, please Click Here. To delete content from content library, go to “Manage Content” --> “Content Library” in your CMS. Search the content you want to delete by using various filtering options available in the Content Library such as Update Date, Content Type or typing the content name on the search bar. Note: When you delete a content, the video mapped with it will not be deleted. However, all the metadata associated with the content will be deleted.